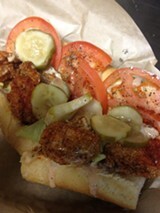 Couyon Cajun's fried Louisiana gulf shrimp po'boy. According to co-owner Jason Herbers, Eli's Mile High Club (3629 Martin Luther King Jr. Blvd., Oakland) has had a reputation for being a "grimy punk-rock bar." But as Eli's approaches its five-year anniversary, an extensive renovation project has cleaned things up while keeping the North Oakland club's dive-bar identity intact, with one major difference: Now, Herbers said, the food is really, really good. Herbers told What the Fork that the centerpiece of the club's big renovation project is a fully remodeled kitchen. To head that kitchen, he's hired David Hledik and Louise Martin, a pair of New Orleans chefs. 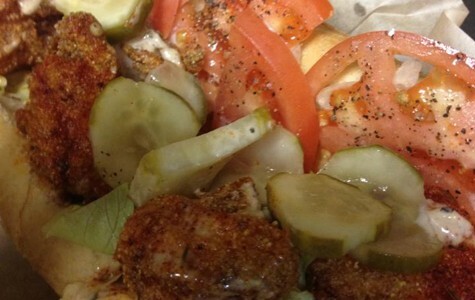 Together, Hledik and Martin are now running a casual restaurant within the club called Couyon Cajun & Po'Boys, replacing standard bar fare — burgers, chicken wings, and such — with New Orleans-style Cajun and Creole cuisine. Couyon Cajun softly opened about three weeks ago and is now open from noon until 10:30 p.m. on weekdays and from noon to 12:30 a.m. on Fridays and Saturdays. Perhaps most notably, Hledik said the restaurant serves as authentic a po'boy (a submarine sandwich, typically filled with fried seafood or roasted meats) as you'll find outside of Louisiana — "the same kind you'd get at any po'boy shop in New Orleans," he said. The menu also features traditional versions of gumbo and étoufée (both of which incorporate wild Louisiana Gulf shrimp and other seafood shipped in from that region) and maque choux, a braised vegetable dish with corn, peppers, bacon, and cream. In addition, Hledik is making a variety of charcuterie in-house, including hog's headcheese, pancetta, boudin, and smoked Andouille sausages. Martin, on the other hand, has an extensive background in Asian fusion cuisine (her previous pop-up kitchen was called Miso Hungry), and you'll find elements of that cooking style on the menu as well, for instance a Vietnamese-style steamed bun with pork belly cracklings and char siu (roast pork), and a dish they've dubbed "Death by Tofu," which features a spicy Thai-style rice vinegar marinade. Herbers stressed that the club is still very casual — as he put it, "it's not exactly a place that people are going to get dressed up to go to." There isn't table service; club patrons can order their food at the bar or at a takeout window. As a result, the restaurant has been able to keep its prices reasonable. Nothing on the menu costs more than $10. To celebrate the club's anniversary and the grand opening of Couyon Cajun, Eli's is throwing a big party on Saturday, September 7, from 6 p.m. to 1 a.m. The anniversary party will feature several local metal and punk acts (see a rundown on page 62), passed hors d'oeuvres, and 50 percent off on all drinks at the bar from 6 to 11 p.m. A limited food menu will also be available, so hungry partygoers can try out a po'boy if they feel so inclined. The cover charge will be $10, and the first sixty guests get a free bottle of champagne. Inside Scoop reports that Chikara Ono, the chef at the popular izakaya B-Dama (4301 Piedmont Ave., Oakland), is opening a new restaurant at Swan's Market in Old Oakland. A few months ago, Ono told me that this project had been in the works since last year, and it sounds like there hasn't been too much tangible progress: Few specifics about the concept have been settled, except that the new restaurant isn't going to be an izakaya per se. According to Inside Scoop, Ono is hoping to open later this year. Couyon Cajun & Po'boys serves stick-to-your-ribs New Orleans fare in an unlikely setting.